Not eating sugar...ummm no thanks, maybe I do need to eat a little less. Running a marathon...a half was enough for me but I do want to do a triathlon...someday. Reading 100 books...I am just happy if I read my Bible daily though there are a few other books I would like to read also this year. I am making goals too but they are more like daily goals, hourly goals, minute by minute goals so I can keep my sanity and be effective and productive in the jobs God has given me. Keeping the kids fed and alive. Staying focused and on track with school. Keeping the house from looking like a garbage dump, aka making sure the kid's are on top of their chores. Less time in cyberspace and more time looking in my kids face's. But seriously, I have been praying and asking God to show me how I can be more faithful with my time and finances and he has been so gracious as to point out some areas that I know I can improve on to make my days more efficient. I don't know about you, but after all the cooking from Thanksgiving and Christmas I really haven't felt like cooking, shopping or planning our meals. We have just been winging it and eating out a lot. Which I am fine with getting a little break from cooking but not breaking our bank account and fast food isn't the greatest on our guts. I usually have a good routine of planning our meals and making a big shopping trip every two weeks to Aldi (don't you just love Aldi?) Sam's Club, Publix and the fruit stand every two weeks. I know it sounds like a lot but when I make the effort my kitchen and life runs a lot smoother. When I don't keep it up things start getting hairy as in I am pulling out my hair because I have to keep running back and forth to the store and we still don't seem to have enough food. With a large family it's detrimental to our survival and to my sanity to plan ahead. Because its never fun when I finish cleaning up the kitchen from lunch to turn around to cries of "I'm hungry, what's for dinner?" To which I answer,"I don't know"... read (while pulling my hair out and yelling)"I just fed you, you can't possibly be hungry!!!!" Thankfully there are a million resources out there to help us weary mom's in the kitchen. But the thing with all those options is that it can get overwhelming and confusing. Here's some practical steps that have helped me without adding to the stress. I hope they help you too! 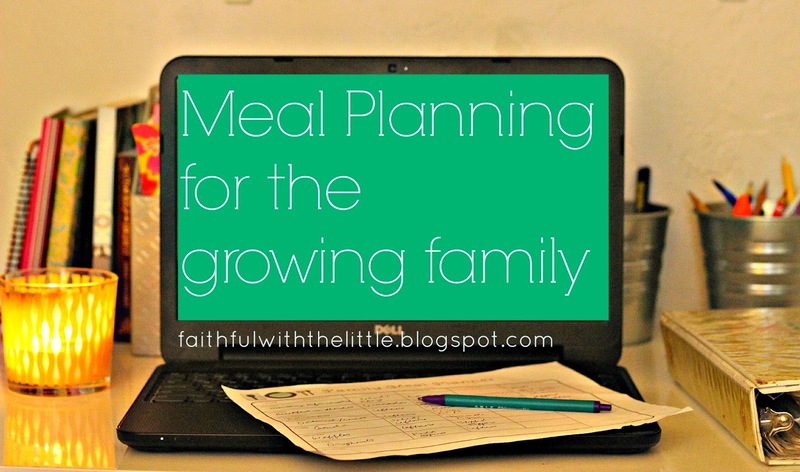 I am not a meal planning authority by any means but this is just what has helped me as I have learned to adjust to feeding my growing family. This free downloadable weekly menu planner from organizing home life and a monthly menu planner from hellobee, or you can buy a reusable dry erase board. It just helps to have it all written down. As long as I have dinner planned out I feel like everything is right in the world. You can even change your dinners around to suit your cravings or time needs. This menu planning advice has helped me also. I try to focus mainly on dinner. I love making breakfast and we usually have leftovers for lunch. I try to plan out our meals and shop every two weeks. It has been the best fit for my family right now but find out what works best for your family and the season you are in. Schedule on your calendar when you are going to go food shopping. Get a babysitter(husband) and get r' done! I like to go early in the morning if I can when there are not a lot of crowds. I usually take one child with me to "help" and to have some special alone time. I remember shopping with my Dad and I still have good memories of getting cookies with him. I loved helping my Dad and having time with just me and him. Whether you go once a week, twice a month or once a month it will help keep you on track in your meal planning and help you not to get stuck without any food in the house. Even if you don't need a lot of things, go anyway so that you can stock up on the things that will run out quickly. I can't tell you how many times I have had to make mad dashes to the store with all the kids in tow to get milk or toilet paper during rush hour...no bueno. Thankfully the kids are usually well behaved( thanks to many years of training) but it's always so much easier not to have to take them all in the store. I can easily get in a rut of making the same things over and over again because I know my kids will like it, but that gets old real quick. I have found pinterest to be a great resource of new meal ideas. Here is the link to my meal idea board that has great meals to keep both kids and adults happy. I also have ripped out a ton of recipes from magazines over the years and put them into a binder, categorizing them into different groups. It's so nice to have them on hand without having to scour multiple sites online. Don't feel like you have to make food network worthy recipes every day. Find out what your family likes and add to your list of favorites; experimenting at least once a week with a new one. I will do pretty much anything to save myself from making more work and cleaning up more messes... give yourself a break too! For a couple of dollars you can save the sink from piling up non stop, that's not too shabby if you ask me! I can't tell you how many times my kids get out new cups because they lost track of theirs. It's so frustrating to see all the cups on the counter that have to be washed...again! I have now put into Harris family law that each person get's their own respective plastic cup with their name sharpied on it and no more wondering whose cup is who's...so be it! We usually use paper plates for lunch when we are pressed for time and need to get back to school and on the weekends so we can enjoy more time together. Trust me... paper and plastic are the new black! For a long time I felt like a slave cleaning up after my kids and having them order me around. Once I realized what was happening I switched gears fast and assigned them age appropriate chores. Now they set the table, clean up and put the dishes in the dishwasher. I usually still have to do a little extra cleaning to get it up to my standards but it's so nice having the extra help and teaching them responsibility at the same time. 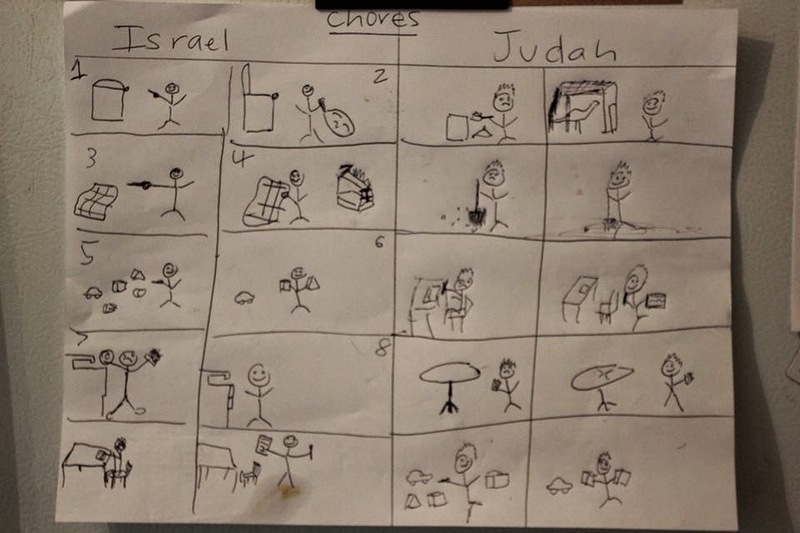 I had my son drew this chart so he and his brother would be sure not to have any excuses! 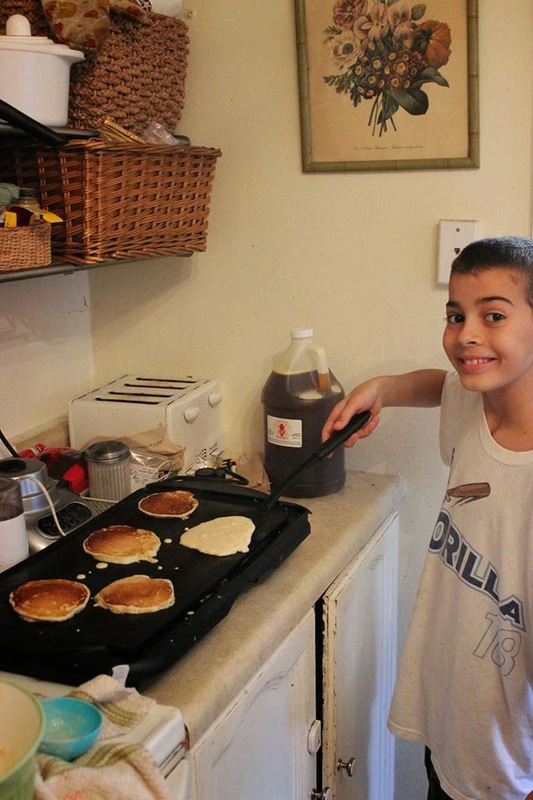 When my two oldest sons were old enough I showed them how to make a few simple meals. This has been so helpful! It been great that they don't have to rely on me for every meal, not only feeding themselves but their younger siblings and myself also. I have been pretty impressed by their cooking skills as well. All the hard work I have poured into them is finally paying off and their future wives will thank me! I love the crockpot! It is one of my best friends in the kitchen. It's the best feeling in the world when dinner time rolls around and there is a tender, delicious meal all prepared..heated up and waiting for you to serve. All you have to do is prepare your ingredients (some recipes require a little cooking) plop them in the crock pot, let them cook and make you look like a superhero. Here is my pinterest board of life saving recipes. At least once a month take the time to make a few freezer meals. It will take a couple of hours but will save you a lot more, especially when you are short for time. 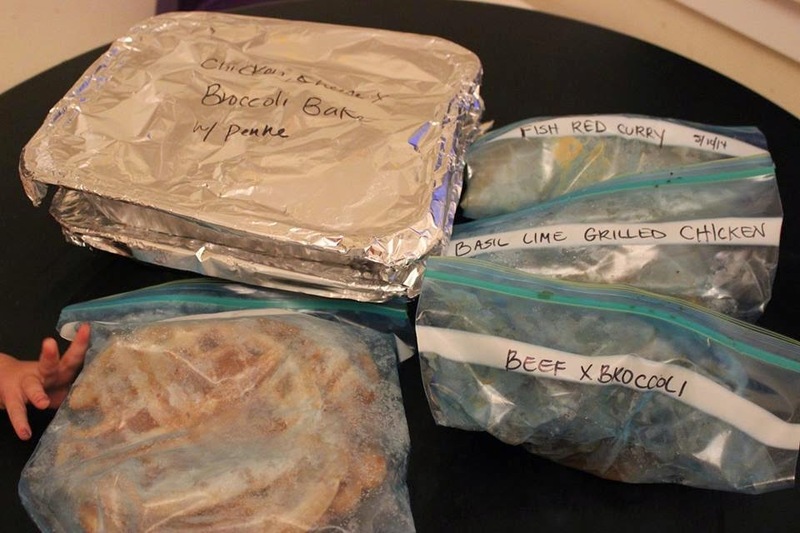 I have done it a couple of times and it has been so comforting to go out to the freezer and take out an already prepared meal when I know I am going to be having a busy day. I am determined to do it monthly. The Pioneer Woman has some great recipes and tips for making freezer meals apart of your life. While you are already making a meal and have all the ingredients out and pots and pans dirtied,why not make some extra for tomorrow's lunch or to freeze? My motto is "It's always better to have too much then not enough" Though I am sure someone else said it first. 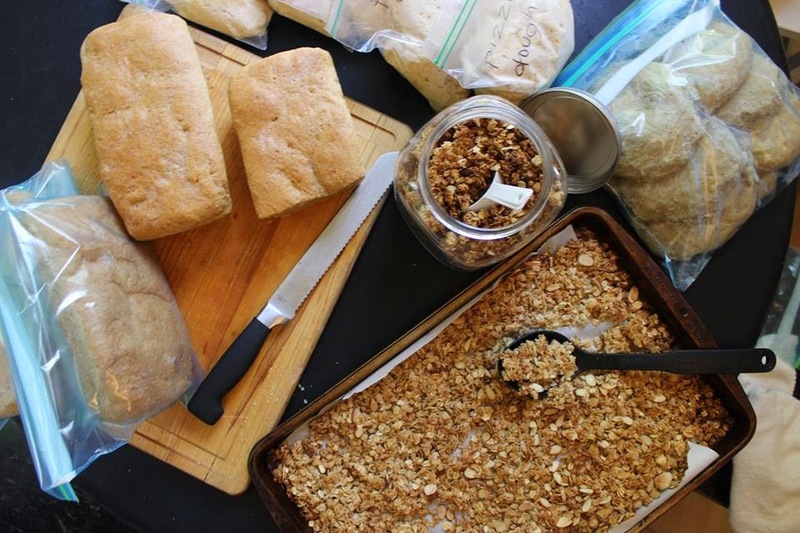 Pizza dough, bread, and granola are great foods to make in big batches! So what does a week's worth of meals look like for my family of 7? I'm glad you asked! So that's what a well planned week's worth of meals looks like. There was once a day when the words menu planning weren't in my vocabulary but since having a very hungry growing family I have learned the power of these words. I haven't always stayed true to them but I hope to use them to their full potential this year. Please let me know if this been helpful to you? Do you have any practical goals for the year to keep you sane? I would love to hear what helps you feed your family!